India's High Court Outlaws Practice Of Instant Divorce By Muslim Men : The Two-Way The decision is a victory for women's rights advocates. Most Muslim countries have already reformed or banned "triple talaq," which allows husbands (and only husbands) to end marriages in moments. 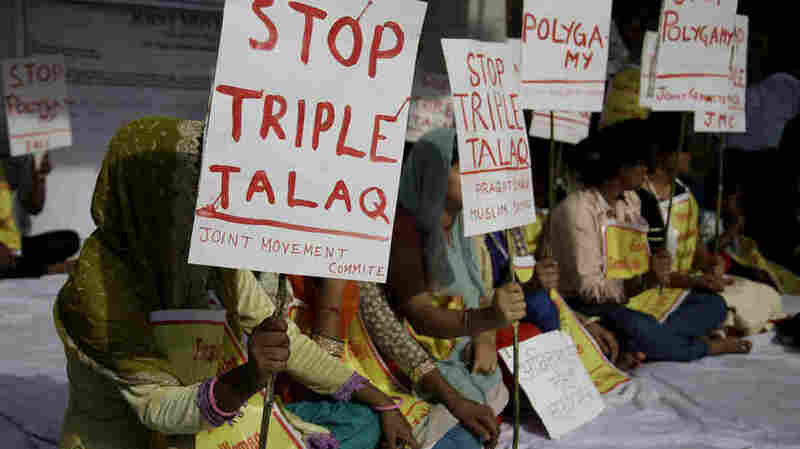 Activists hold signs during a protest against "triple talaq," the practice of instant divorce by Muslim men, in New Delhi on May 10. The country's Supreme Court has outlawed this means of ending a marriage. Muslim men in India will no longer be able to terminate their marriages in a matter of moments, after a split decision by the country's Supreme Court overruled the practice of "triple talaq." Previously, Muslim men (and only men) could irrevocably end their marriages by repeating "talaq," the Arabic word for "divorce," three times. Women's rights advocates in India have fought to end the practice. Now, three of five judges on the Supreme Court have ruled that the practice violates the country's constitutional guarantees of equality. India is majority Hindu but is home to the world's second-largest Muslim population, according to the Pew Research Center. It was an "outlier" among Muslim countries for permitting "triple talaq" until this year, NPR's Julie McCarthy reports. Most countries had already reformed or banned the practice. In India, The Associated Press reports, Muslim instant divorce was protected by "laws that allow Muslim, Christian and Hindu communities to follow religious law in matters like marriage, divorce, inheritance and adoption." "While most Hindu personal laws have been overhauled and codified over the years," the AP notes, "Muslim laws have been left to religious authorities and left largely untouched." The justices ruled that the practice is "not essential to the Muslim faith, and thus failed a key legal test," NPR's Julie McCarthy reports. The court noted that "the Quran had attributed 'sanctity and permanence to matrimony' and encouraged reconciliation between couples. But the court said with "triple talaq,' which amounts to instant divorce, 'this door is closed.' "
Justice Rohinton Fali Nariman said it was "manifestly arbitrary" to allow a Muslim man to "whimsically and capriciously" divorce his wife, according to The Hindu newspaper. A husband invoking triple talaq had unilateral power to end a marriage; his wife had no say in the matter. Heated but trivial arguments could result in instant divorce, and in the modern age, the practice could be invoked by telephone, text or email, Al-Jazeera writes: "Muslim women say they have been left destitute by husbands divorcing them through 'triple talaq', including by Skype and WhatsApp." Another Supreme Court justice, Kurian Joseph, noted that the practice goes against the tenets of the Quran. "What is banned in Quran cannot be good in [Sharia law]. What is banned in theology cannot be good in law," he observed, according to The Hindu. "Zakia Soman, co-founder of the Indian Muslim Women's Movement, says her organization sees many women who want to stay in unhappy marriages to avoid becoming destitute. These women seek to keep 'the status of wife' because they are so vulnerable, she says. Soman calls talaq a 'sword hanging over a woman's head,' and says domestic violence and the male prerogative to declare instant divorce are intimately linked. "In 2015, Soman's organization surveyed India's Muslim community ... [and] found that 1 in every 11 women has had their marriage ended by talaq. Of those divorced women, fewer than five percent ever gets any financial support." Soman's organization has been campaigning for two years to have the practice overturned. In evaluating the case, Indian courts were weighing "two competing rights: the guarantee to equal treatment under the law and the guarantee to freely practice one's religion," McCarthy reported in May. But, as Justice Joseph noted, triple talaq does not appear in the Quran and its religious significance is disputed — it's endorsed by some Muslim clerics in India, but condemned by other Muslim leaders as un-Islamic. McCarthy spoke to an Islamic law expert in March who said "instant divorce" is a perversion of Islam. Tahir Mahmood explained that the Quran requires a period of reflection and attempted reconciliation before a divorce. "The original version of the Quran ... insists on gender equality. And that is precisely what is missing in India," Mahmood told McCarthy. He told her that politicians were worried about offending powerful Muslim clerics and that to change the practice of triple talaq, "the only hope is the judiciary.' "
The Supreme Court deliberated for three months before ruling that the practice was unconstitutional, according to the AP. Indian Prime Minister Narendra Modi celebrated the decision on Twitter, calling it "historic" and saying that it "grants equality to Muslim women and is a powerful measure for women empowerment."